BackBlaze is a popular cloud storage provider that is most well-known for their unlimited backup capabilities. 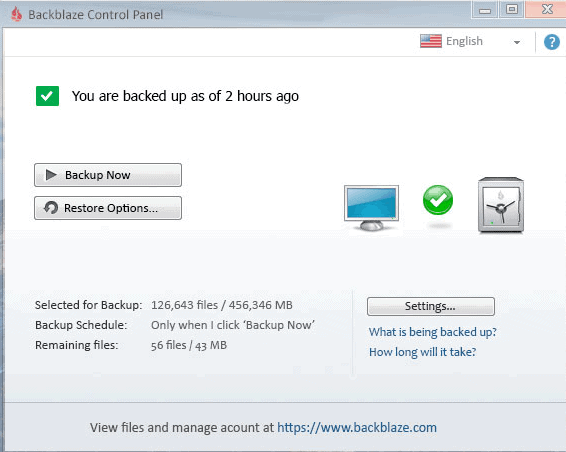 While there have been several companies that have offered unlimited online backup to their users, very few of them are as easy-to-use or have been as successful as BackBlaze has been over their time in the industry. One of the main benefits of going with BackBlaze is that they automatically backup all of your files without you having to do anything. A lot of cloud storage users get worried about storing important information through the cloud because of the possibility that a major issue could cause them to lose everything. You will not have to worry about that with BackBlaze, however, as they make sure that all of your files are completely backed up. While most cloud storage providers will give you a limit on the amount of data that can be backed up, BackBlaze actually offers unlimited backup for all of their plans. They also allow you to upload files of any size and provide unlimited bandwidth. This is fairly incredible considering the fact that they are among the most affordable cloud storage and online syncing companies in the industry. If you are trying to figure out which cloud storage provider will be best for you, one of the first things that you are probably worried about is how easy-to-use the provider is. Fortunately, BackBlaze has really set the bar high for simplicity and offer what is probably the simplest interface in the industry. While almost every cloud storage provider allows users to access their files through a mobile app, very few of them are as easy-to-use as what BackBlaze offers. Whether you are attempting to access your files from an Android or iPhone device, the BackBlaze app has been raved about for its reliability and simplicity. BackBlaze advertises themselves as the cheapest cloud storage provider in the industry and you will have a difficult time arguing with that claim. For comparison, both Amazon Web Services and Microsoft Azure are 440% higher in price than what BackBlaze offers for GBs used per month. Personal Backup – At $5/month, this service backups an unlimited amount of data. Unlimited bandwidth and unlimited file size. You can also download a free restore or have a USB hard drive or USB key Fedex to you. Business Backup – $50/year/computer. This is an award winning service which is available to businesses. Features unlimited data and backup all your companies laptop and desktop computers to the cloud. B2 Cloud Storage – $0.005/GB/month. Unlimited data storage. Works similar to Amazon S3 or Microsoft Azure at a lower price. First 10GB is free. This also features a simple drag-and-drop interface. Customer support is certainly not a strong point of BackBlaze, although there really is no reason for it to be. Their desktop and mobile interface is basically self-explanatory and the fact that they have very few features means that there is little reason to ever have to contact their support team. If support is important to you, however, you will be happy to know that they do offer ticket based assistance to all users of their premium plans. As of now they do not currently offer any type of live phone call support. The main disadvantage of BackBlaze is that they do not give you the ability to share your files. This is one of the reasons that they are able to offer such low prices as they focus almost solely on cloud backup capabilities. They also do not have too many secondary features for users to utilize, making their services impossible to use for collaboration and team based projects. The pricing for BackBlaze cloud storage services are very straight-forward. Storage is $0.005 per GB per month for the one and only plan that they offer. 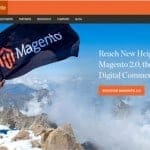 Their backup plans, which they are most well-known for, will set you back a meager $5/month per computer whether you are going with the personal or business plan. You can also pay annually for only $50/year. 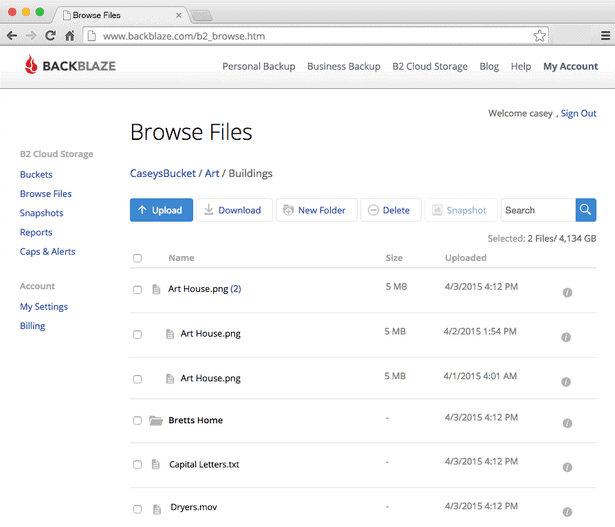 Overall, BackBlaze is a cloud storage provider that focuses on ensuring that your files are safe and secure. The real beauty of their services is that they do not try to be something they are not and are very transparent about exactly what they do. You certainly will not see one of their sales representatives trying to explain to you how they can also be used for team collaboration and other second-hand possibilities that providers like DropBox offer. 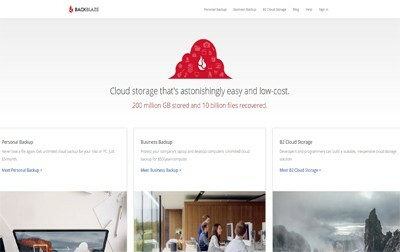 If you are looking for an affordable cloud storage provider that take the stress and inconvenience out of having to continuously backup your files, it does not get much better than BackBlaze. As has been mentioned, however, just do not expect them to do too much more than that. Unlimited Online Backup. Restores files and access files on iPhone, iPad or Android. Automatic or Scheduled Backups. Unlimited cloud backup. Cost efficient and centralized admin. Foolproof & offsite. Restore options. The lowest cloud storage on the planet where developers and programmer can built a scalable, inexpensive cloud storage solution. Unlimited online backup. Easy and simple to use with lesser price compared to other online backup providers. They do not currently offer live phone call support.